My love of clay started when I used it for the first time on my Art Foundation course at Bristol. I then studied ceramics at Farnham College of Art taught by, amongst others, Henry Hammond, Paul Barron and Mo Jupp gaining my degree in 1971. My first studio as a potter was in Lots Road, Chelsea and after working in various studios sometimes with other potters I now work on my own in a studio built in my garden at home in Perivale, West London, alongside my painter husband David. 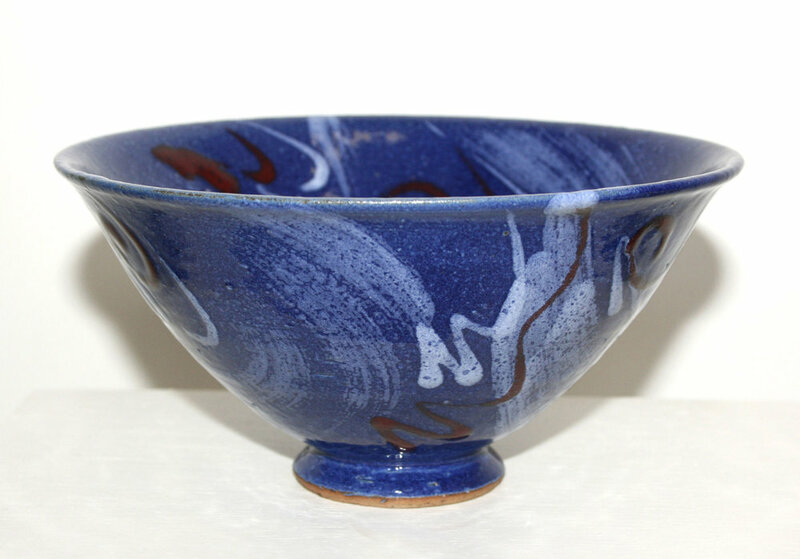 I have also taught pottery part-time in schools, adult education and now privately. My work consists of thrown and handbuilt stoneware functional forms. I like to make simple forms that will act as a ‘canvas’ for the variety of glazes. The decoration is created by using various coloured glazes, which are applied and overlaid using dipped, poured, trailed and painted marks and shapes. I am interested in the interactive qualities and juxtapositions of the varied surface qualities and colours of the glazes. The way that painters such as Patrick Heron, Matisse and Pollock use shape, colour and mark have indirectly influenced the use of glaze in my work. Another great influence has been the overlaid glazed pots of Shoji Hamada. I formulate my own glazes using ongoing tests to expand my colour range and to experiment with the interaction of various combinations of overlaid glazes. I have been a member of London Potters Association since its formation, exhibiting in many of its frequent exhibitions and for a time co-editing the newsletter. I have taken part in numerous exhibitions since 1972 including: Festival of European Ceramics Claymore, Dorset; Great London Teapot Exhibition; Morley Gallery; Clayworks 2 and Clayworks 4 at Contemporary Ceramics Gallery; Party Pieces at Art Connoisseurs Gallery; Festivals; Harlequin Gallery; various regular exhibitions with the ‘West London Artists' and ‘Take Four’ groups; Ealing Open exhibitions; and many more. I have exhibited in art fairs including the Art in Clay Southern Pottery and Ceramics Show, Farnham.